Everyone is Irish when there’s an Irish Coffee to be had. This is Page 2 of a two-page article. Click on the black links below to visit Page 1. The original Irish Coffee recipe is on Page 1 of this article. 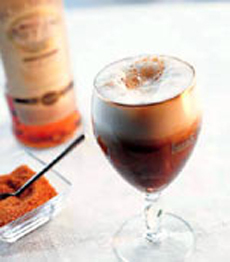 Over the years, there have been many variations to the original recipe: using espresso instead of coffee, substituting Irish Cream Liqueur for Irish Whiskey, adding a liqueur to the Irish Whiskey—from coffee and chocolate liqueur to hazelnut and coconut—and adding garnishes ranging from cocoa powder and Hershey’s kisses to decorative sugar crystals, espresso beans and chopped nuts. Combine ingredients in a goblet or mug and stir to dissolve sugar. Float cold cream gently on top. Do not mix. Instead of heavy cream, add whipped cream, sweetened or unsweetened. Add some “green” with 2 teaspoons creme de menthe; mix before adding the cream cap. Or, to better show your Irish colors, drizzle the creme de menthe over a whipped cream top. Combine ingredients in a goblet or mug. Add whipped cream. Sprinkle with chocolate flakes. 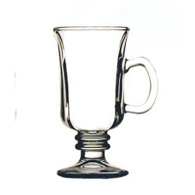 Bartender’s Tip: With all recipes, preheat the goblet or mug by rinsing it with hot water. Coffee Shape. Click here for more information. Mikasa Lead Crystal. 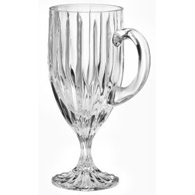 Go fancy with this European lead crystal mug that’s dishwasher safe. Click here for more information.